We want an organization of 20,000 learners and 20,000 teachers. Did you know that 95 million employees in the United States alone are not engaged or are actively disengaged in their work? Did you know that even high performers in excellent organizations—large and small, for-profit and non-profit—frequently report that 30% to 40% of their talent that could be applied at work lies untapped? Are you looking for a fresh approach to engage your employees and create a culture of talent development in your organization? Want to learn how to tap the only true and lasting source of motivation—self-motivation? Are you frustrated that time, money, and resources limit the reach of your talent development programs, often restricting them to “high potentials?” Interested in how you can reach up and down and across your organization with a program that scales easily so that you can offer it broadly and get everyone engaged and contributing? The Take Charge of Your Talent Program helps you fully develop the talent assets of your organization to increase creativity, productivity, and satisfaction. In contrast with top-down succession plans and other talent development strategies, Take Charge of Your Talent taps your participants’ own interests, energy, and aspirations. It applies the latest scientific knowledge about constructive thinking to catalyze rapid results. What’s more, these tools scale efficiently so that you can reach deeply into your organization. Keynotes and Presentations. We provide speakers for meetings and conferences that spark lively conversations and concrete actions for each of you to take charge of your talent. See Take Charge of Your Talent–in Action–a quick start demonstration and discover how a room of 280 business and civic leaders came alive as Talent Catalysts for one another. Workshops and Programs. We customize offerings for the needs of both commercial and non-profit organizations to stimulate a take-charge talent culture in your organization and enduring results. Take Charge of Your Talent Champions Training. As part of all organizational programs, we encourage a minimum of 10% of the participants to be trained as Take Charge of Your Talent organizational champions; people who stand for and support a thriving talent culture. Coaching. We provide master coaches for executives who want to build and sustain Take Charge of Your Talent cultures. 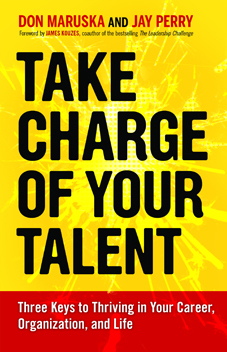 Want to explore how you can bring Take Charge of Your Talent into your organization? Click here to ACT NOW. Want more specifics on why Take Charge of Your Talent is so effective for organizations?